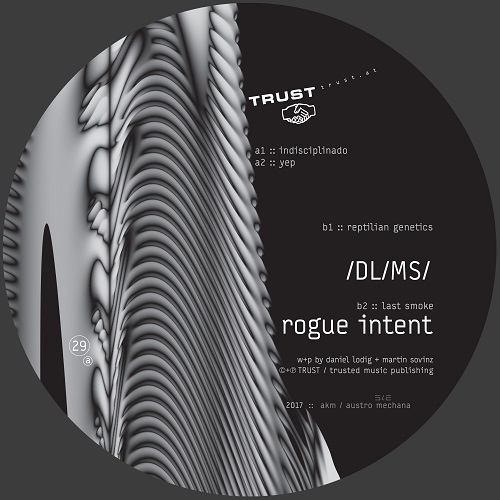 TRUST from Vienna calling with “Rogue Intent” when Dan Lodig, who was behind last year’s Lok44 EP, returns to the label with Martin Sovinz under the project name /DL/MS/. TRUST is regarded as electro outlet and while the duo is not going to dispute its style preferences, their peculiar view on combining mechanical beats and voice samples offers a few surprising, quality moments. Inheriting some elements from IDM, the rather lingering opener “Indisciplinado” is difficult to categorise when it travels from artsy surroundings to sticky bars with hardly audible background voices. The next track “Yep” starts with hollow medieval drumming and Oriental strings before merged with devouring corrosive grooves that can match Khan & Jammin’ Unit’s toxic electro hop from the nineties. The B-side is the winner: rusty vocoder interference is proclaiming mind control in non-protective “Reptilian Genetics”, its sturdy bass and sci-fi pads leaning to classic electro. Clearly of rogue, barrier-breaking kind is “Last Smoke”, built on processed voice loops and abusive bass sequences. TRUST’s another release this spring comes from Martin Stepanek aka M_Step, a lesser known associate of Cheap Records who has released on the Austrian cult label as a member in groups 550 Rondy and Loser. “Cold Dust” features four dreamy, transparent electro tunes, my recommendation going to the opener “Xylograph”.